The Loves of Jenn: A special announcement! Julianne has a special announcement! As you can see, she is super excited! 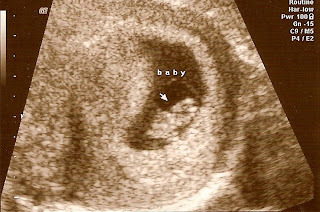 Our first ultrasound picture from July 1st. I am 10 weeks tomorrow. Congrats! 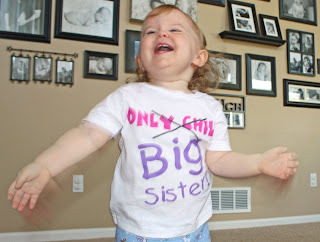 You are going to be an awesome big sister, Julianne! can't wait to hear more about your pregnancy. I pray everything goes great. Congrats Jenn! So happy for you! I hope you're feeling well! I am so thrilled for you!!! Congrats! oh wow!! Congratulations :) I am so excited for you!! and Julianne is going to be the cutest big sis! Congratulations, Jenn. Here's to a healthy and happy pregnancy! Congratulations, Jenn! I'm thrilled for all of you:) How exciting! I had two of my boys in February. That's a great Valentine's gift! WAHOO!!!! I'm SUPER DUPER STOKED for you guys, incase you can't tell:) This is the most awesome news. You are the cutest little family and I am so excited to read about this new little baby as it grows! Congratulations to you all! What awesome news!! Congrats!! 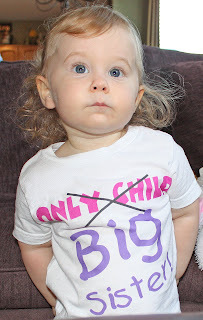 Love the shirt, she is a doll. OK I detect a pattern! Everytime I see you - you announce you're pregnant shortly after! :) Let me know when the next time I should come visit is!!! SOOOO excited for you guys - Congratulations!!!! YAY!! I am so excited for the two of you. Looooove the shirt on Julianne, I just want to snuggle her up. Hope you are feeling well and not pukie. Very exciting news! So sweet! Congratulations Big Sis! I bet you are going to teach her lots of things and mommy will be there to help, not that you'll need any help, for Big Sis knows it all. If not ask my big sits lol. I'm very happy for you, may you and your family be blessed. I stopped by from SITS to leave you some comment love, but it seems that you brighten my day instead. New life is always an amazing news! How exciting Jenn! I love the shirt that Jules has on...adorable. I also love the picture wall behind her. How are you feeling? February 12th is my birthday, woo-hoo! Aww I love these sibling shirts! :) this is too cute. I saved all my sonogram pictures and each of there positive tests!! Im obsessed with memories. Congrats, girlie! What awesome news.